If we put aside all metaphysical and religious dogma and rely only on facts, or objective truths, then it is impossible to arrive at a hard anti-abortion position. Historically, abortion was condemned in Christianity (and in its derivative Islam) because it was believed that ensoulment—the obtaining of a soul—takes place before birth. In Christianity, it was held that ensoulment must take place at conception otherwise the human nature of Christ would have been fashioned in the womb, apart from His divine soul, prior to ensoulment. Since orthodox Christian theology held that Christ was not a man who became God (or a God who indwelt in a man) but rather God incarnate (the God-Man), it was necessary to insist that ensoulment happened at the very moment of conception. Thus, ensoulment was believed to take place at conception. 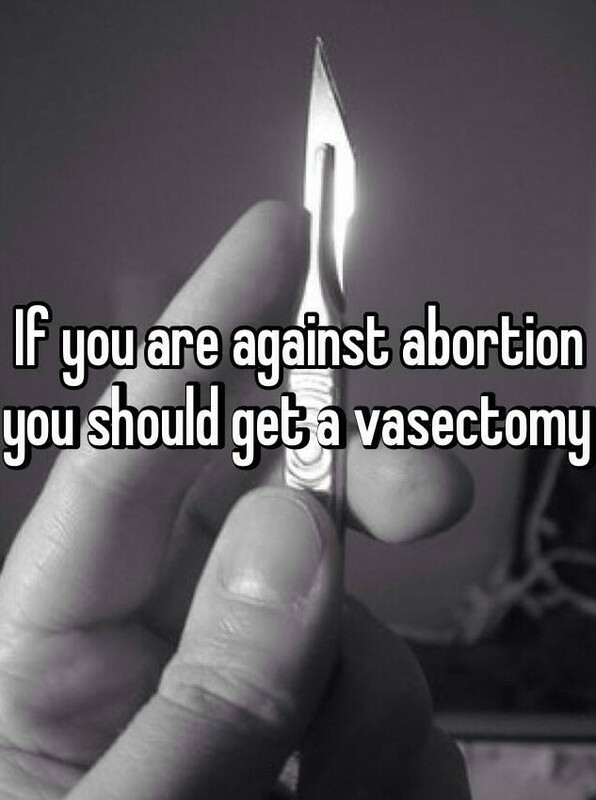 Consequently, any abortion would necessarily constitute murder. Only baptized individuals were allowed into heaven, which is why the early Church insisted on baptizing infants. Abortion would damn an infant/fetus to hell for all eternity as the souls of the unborn were unable to be saved through baptism. Abortion was also frowned upon by early Christians because of its association with Temple prostitution. This is the religious background for why abortion was viewed as murder. Islam, lacking the concept of a God-Man, held that ensoulment occured four months into the pregnancy. Thus, abortion was regarded as somewhat permissible prior to ensoulment, but not permissible after. The thing to note about these justifications for opposing abortion is that they are anti-scientific. They are based on arbitrary religious dogma and not on objective fact. Beyond these old religious dogmas, the main argument against abortion is that the fetus either is human or has the potential to become a fully-developed human. This, though, is also non-scientific and non-objective. It is based on a vague sentiment and usually also on the speciesist assumption that human life is somehow more valuable than all other forms of life. This sentimentality and speciesism that lies beneath anti-abortion sentiments is really, in my opinion, based upon subconscious religious assumptions that have become ingrained in us through cultural and social conditioning—we, knowingly or unknowingly, assume that we are the greatest of all creatures, alone created in the image and likeness of God. Now, if we want to approach ethics from a scientific and objective perspective, what can we say? Well, we must find something that we can say that will be universally accepted by all humans (or, at least, nearly all humans). We must find some ethical criteria upon which people can generally agree. One can do this from either a deontological or a consequentialist approach, and it really doesn’t matter at all which route one takes, as these two paths converge when one thinks about them rationally. These two approaches cease to be contradictory and conflicting when you remove all the arbitrary and superstitious elements. In fact, as contradictory as it may seem, the only rational perspective is a deontological consequentialism or a consequentialist deontology. First, we must find an objective and universal basis for human ethics. What might that be? Well, quite simply, that is the ancient tradition known as natural law theory. Natural law theory says that there are certain rules or principles of ethics that are enshrined in human nature, shared by all members of the human species, and that these principles are to serve as the rational basis of human ethics. We typically associate natural law theory with Christianity and religion. Christian theologians have held that natural law is inscribed on the human heart, enshrined in human nature by God who fashioned us in His image. Nevertheless, long before St. Thomas Aquinas arrived on the scene, Aristotle had espoused natural law theory in the form of an ethical naturalism, a scientific theory of ethics based in human nature. In recent times, Larry Arnhart has revived this Aristotelian tradition of natural law, arguing for what he calls Darwinian natural right. According to Arnhart, all species have certain characteristics in common—each member of the species has a shared nature (that’s what nature or physis originally meant, the shared characteristics or features that generally belong to members of a group). All humans share in human nature and have certain features and characteristics in common as members of the same species. From a Darwinian natural law perspective, which is arguably an approach first put forth by Darwin himself, we can say that our shared nature is an emergent phenomenon resulting from evolutionary processes. As natural selection chipped away at the nature of our ancestors, it acted as a “blind watchmaker” or “blind god,” slowly fashioning human nature into what we have today. The particular values that we all share today were “chosen” by natural selection because they helped us to survive as a species. Our love for our children allowed our children to survive and reproduce because it made our ancestors willing to do anything to protect their offspring. Consequently, natural selection favored paternal and maternal instincts such as we have today. Specimens that just let their children be eaten by wolves ended up with no offspring living to pass on their genes. This Darwinian natural law theory is the deontological approach that I prefer. However, it is worth noting, as Larry Arnhart has observed, that this natural law approach works regardless of whether you ascribe to theistic natural law theory or Darwinian natural law theory. It doesn’t really matter whether the shared principles of morality come from God or from natural evolutionary processes. All that matters is that all humans do share in a common human nature that entails certain shared values. When you delve into natural law, looking for the things that all humans value, you’ll find that people generally value well-being, happiness, security, etc. This, of course, means that the deontological natural law approach and consequentialist and utilitarian approaches are not necessarily mutually exclusive. All deontological approaches are consequentialist. Why ought we to obey natural law? The theist will say because it is God’s will and we would like to either please God for its own sake or else do as God says in order to avoid punishment. Thus, theistic natural law reduces to consequentialism. The proponent of Darwinian natural law theory will say that we value what we value because it makes us happy. What makes us happy is what we value—that is, to value it is simply to think that it promotes well-being or happiness in some way. Thus, deontology breaks down into consequentialism. At the same time, consequentialism builds up into deontology. If the goal of ethics is to pursue well-being, happiness, and security, then we will promote actions that tend to have the consequence of maximizing well-being. From a utilitarian or consequentialist perspective, you can lay out a set of normative rules to guide human actions—if one follows certain rules under certain conditions, it will tend to maximize well-being. This can also be reconciled to virtue ethic approaches—if one develops moral character and learns to instinctively behave appropriately (i.e. acquires virtue), then their patterns of behavior will tend to maximize well-being. My point here is that the various approaches to ethics tend to be more complimentary and compatible than ethical philosophers would lead one to believe. Elsewhere I have written more extensively on ethics. I also like Sam Harris' moral landscape approach to ethics. Harris argues that happiness is good and that suffering is bad. A world in which everyone enjoys the maximum amount of happiness and the minimum amount of suffering is obviously the best possible world. A world in which all people suffer the most they possibly can and no one enjoys any happiness at all is obviously the worst possible world. It's just obvious that that's what good and bad are! Now, we can think of a moral landscape in which there are mountains and valleys. The mountains represent the peaks of human happiness and the valleys represent the depths of human misery. There may be multiple ways of reaching the same height, as different mountains may have similar altitudes. The goal of ethics should be to move away from the worst possible world scenario and into the direction of the best possible world scenario. We should try to maximize happiness and minimize suffering. The common theme in any critical rational or scientific approach to ethics is that it basically regards happiness as goodness and suffering as badness. If we want to look at the issue of abortion from an objective and scientific perspective, this is the sort of ethical lens that we must look through. If abortion is bad, that implies that aborting a fetus causes more suffering than carrying it full-term and letting it develop into a baby and be born. There is not a shred of evidence to suggest that this is actually the case. In fact, from a rational and scientific perspective, it would be easier to make the case that bringing a child into this world is infinitely more unethical than aborting a fetus. Applying a rational scientific approach, there are a series of objections that one could use to counter anti-abortionist logic. First objection, the anti-abortionist would trade the perceived suffering of the fetus for the actual suffering of the mother. We know as a fact that the perception of pain results from signals from nerves being sent through the spinal cord into the brain and ultimately to the cortex. That's how the nervous system works. We also know, from studying embryos, that the nervous system doesn't fully develop until the third trimester. It is a fact that a fetus cannot possibly feel pain prior to the seventh month of pregnancy because the nervous system isn't developed yet! Even after the nervous system becomes fully developed, the brain does not show any signs of activity for several more weeks. Life, consciousness, and the ability to feel pain are phenomena that don't occur until the last two months of pregnancy. Now, we know as a fact that the mother can feel pain and that being forced to give birth to a child will result in what is probably the most pain a person could possibly have to go through. According to our theory of ethics, abortion (at least prior to the last two months of pregnancy) is not unethical at all. In fact, it is much more unethical to force a woman to give birth than it is for her to abort. Second objection, there is the question of the suffering of the fetus itself. Until the third trimester, the fetus is unconscious, having no brain activity, and incapable of suffering. If the fetus is aborted, this guarantees that the fetus will never grow into an adult and, consequently, will never suffer. The abortion actually spares the fetus suffering. This is especially the case when unwanted pregnancy is involved. If a woman is going through homelessness or poverty, she may not have the resources to care for a child and abortion may actually be a less cruel fate than being brought into existence. The unborn fetus, if carried full term, may be born into a poor community, experience poverty growing up, end up turning to drugs as an escape from the hardships of life, and ultimately wind up in prison. Sometimes an unwanted pregnancy results in the birth of a child whose life is decent and enjoyable, but sometimes the quality of life that such a person will experience is actually worse than never having been born. This objection to the anti-abortionist agenda could possibly be answered by a proposal for extreme welfare provisions. If you can use something like universal basic income (or even a more conventional form of welfare) to guarantee that no unwanted pregnancy will result in the birth of a child who will experience poverty, then the anti-abortionists position could perhaps be taken a bit more seriously. Nevertheless, most anti-abortionists are not for such welfare provision and, even if they were, this still would not address the first objection and only very inadequately addresses the second. Third objection, it may be the case that bringing a child into this world is everywhere and always more unethical than aborting a fetus. We live in a world of uncertainty. As time goes on, the political climate gets worse and worse. The children born today may likely live to see the entire world destroyed by pollution, global warming, or even nuclear warfare. Modern capitalism is becoming more and more unbearable everyday, as jobs are lost to automation. We have an economic system in which survival is tied to wage labor, but jobs with sufficient wages to live on are becoming harder to find. Full-employment is likely a thing of the past. The lives of our children will definitely be much more difficult than our lives have been. As time progresses, it just gets worse. Personally, I hope that government will become more progressive and implement policies to fix the problems of modernity, but I have my doubts that things will actually play out in a positive way. I hope for a progressive government to emerge that implements a job guarantee program to restore full-employment, implements a universal basic income to ensure that everyone has sufficient access to the things needed for survival, and promotes technology and science aimed at ushering in a transhumanist era. But that is all very unlikely. With all probability, our children's lives will be worse than ours. Here we must stop to wonder if reproduction is really a responsible and ethical thing to do. It seems likely that the moral imperative is to avoid reproduction. And this could mean that abortion is actually the morally preferable behavior. Anti-natalism actually appears to be a logical position to hold. Fourth objection, why should it matter if the fetus is human or could potentially become human. The most logical argument against abortion supposes that the fetus either is a human or else is a potential person and, therefore, that abortion ought to be opposed on those grounds. But why should humanness matter? Adolf Hitler, Jeffrey Dahmer, and John Wayne Gacy were all humans, as were all of their victims. Humans are capable of doing terrible things and of suffering greatly. Humanness, in itself, seems to be meaningless. Furthermore, this argument reeks of human supremacism and speciesism. We are simply one species out of many, perhaps the most intelligent but only so by chance. We are no more capable of joy and suffering than most other animals. The cow that is slaughtered for your dinner was surely more alive, more conscious, and more capable of suffering than any fetus that ever got aborted. If you oppose abortion but do not advocate veganism, then your system of ethics is morally bankrupt. Commenting on this Story will be automatically closed on November 20, 2018. Fun fact: It is recorded Saint Brigit caused spontaneous abortions as a miracle. The patron saint of abortion! "A certain woman who had taken the vow of chastity fell, through youthful desire and pleasure, and her womb swelled with child. Bridget, exercising with the most strength of her ineffable faith, blessed her, caused the foetus to disappear, without coming to birth, and without pain. She faithfully returned the woman to health and to penance."